Company will power MediaJobCenter.com for the publishing, digital and broadcast media news sites. Petaluma, CA, USA — Cross-Post LLC, the leader in niche recruitment network advertising and job center platforms for the newspaper and publishing industry, announced today a new partnership with NewsCheckMedia LLC, which publishes NetNewsCheck.com and TVNewsCheck.com. The company will power the MediaJobCenter.com job board that will focus on career opportunities for the industry. “We are very pleased to have been selected as the platform provider for this excellent news site. NetNewsCheck.com and TVNewsCheck.com are incredible resources for news and information in the publishing and broadcast media industries. MediaJobCenter.com will be the “go to” career opportunity resource for people looking for a new job with media companies.” Noted Carl Braun, CEO of Cross-Post LLC. Kathy Haley, Publisher of NewsCheckMedia agrees. “One of the biggest challenges our audiences face is placing the right talent into a changing mix of jobs in senior management, revenue generation, content creation and technology. MediaJobCenter.com will deliver the same quality leads and prospects as TVNewsCheck and NetNewsCheck classifieds have always done, but on an advanced, unified platform designed to streamline the process of posting jobs and simplify the task of looking for a new job. MediaJobCenter.com will feature career news and information and products that enable employers to recruit and consider women, minorities, veterans and IT professionals. The job board is free to candidates and offers posting and advertising opportunities for employers at very reasonable rates. The Cross-Post Technology utilizes the “tracklet” tool that enables the candidates to search for jobs and fill out applications quickly and completely. It is mobile enabled and can operate fully on any size screen or mobile/desktop device. For over eleven years, Cross-Post LLC has been the industry leader in niche recruitment network upsells for newspapers and publishers serving over 200 clients like the Washington Post, Seattle Times, The Oklahoman and the Houston Chronicle Its technology recruitment classifieds platform utilizes award winning technology and niche networks in fourteen different categories like Diversity, Healthcare, Trucking and Social Media employ the largest job board providers in each category. NewsCheckMedia publishes TVNewsCheck.com, the leading source of business news for the broadcast television industry, and NetNewsCheck.com, a leading source of business news for media executives, managers and professionals competing on the front lines of digital disruption. New website helps job candidates manage their careers, apply for job opportunities, or take a college course using any mobile device. Petaluma, CA, USA (March 23, 2014) — Cross-Post LLC, owner of Cross-Post Digital Recruitment Networks and co-owner of the CareerPointe Recruitment Classifieds Platform for publishers, announces the launch of its newest career management tool. Career-Wallet.com is a web portal that provides free employment and career search tools, along with free and low-cost online educational opportunities from colleges and universities around the world. It is one of the first products of its kind and utilizes the ONREC 2014 award winning Tracklet? technology from Careerleaf of Canada. “After considerable research, it was determined that job candidates viewed the job search and hiring process negatively. At the top of the list was having to fill out dozens of applications and then throwing them into a black hole. They would search for jobs in the morning on their mobile devices and have to wait to apply for them that evening on their desktop. We set out to improve the candidate engagement experience and, with our partners, have created a truly unique job search and career enhancement tool that candidates can use for the rest of their lives.” Noted John Fujii President of Cross-Post LLC. Career-wallet.com allows candidates to create their own personal job search portal quickly, using their LinkedIn account or resume to fill out their profile. They can upload multiple resumes and cover letters and keep track of every job lead and application for the rest of their careers. Though not a job board, Career-wallet.com gives them access to every job board on earth through the website. To apply for a job online, they simply have to drag their Tracklet? to their browser toolbar to the apply button, fill in the application with one click, retrieve their resume and cover letter, and hit apply. That job then appears in their Job Manager where they can track the progress of the application, and get tips and reminders to research and follow up with employers. Everyone is a job candidate at one time or another, and passive and active candidates can use Career-Wallet.com to improve their skills by taking free and low cost courses from some of the top educational institutions in the world. Through a partnership with the folks over at MoocTracks, candidates can search a global database of more than 14,000 Mooc’s or massively open online courses. “This is such an awesome resource for early career and college students as well as the more seasoned professional who may be looking for a career change or finds themselves in outplacement. My son signed up for a free course in Business Theory at MIT (Massachusetts Institute of Technology) in about five minutes and it is being taught by some of the top business minds in the country today. What a great resume builder. ” Said Carl Braun CEO of Cross-Post LLC. “Mobilizing your job search is particularly appealing to candidates that are on the road often. From truckers to road warriors, everything available on Career-wallet.com can be done on a smartphone or tablet. The website is responsively designed, so it work on any size screen or mobile device. Applying for a job on your smartphone with a few clicks is a huge advancement in the marketplace. Cross-Post plans to work with outplacement firms, college sites, veterans groups and others to extend this free tool to any and all candidates interested in finding a new job or building their knowledge base. The tools found on Career-Wallet are built into all CareerPointe job boards. For more than a decade, Cross-Post LLC has been the leader in niche recruitment networks and technologies for newspapers and publishers. With more than 250 newspaper clients and dozens of niche network partners, Cross-Post has helped hundreds of thousands of job candidates over the years find gainful employment. Visit http://www.cross-post.com for more information. Careerleaf Inc is a technology company whose mission is to make job search and online recruitment simple, effective, and more humane through its software and services. Everything we do at Careerleaf is guided by our fierce dedication to providing great user experiences, beautiful and practical design, and technology that makes it easy to adapt to change. For more info, please visit http://www.careerleaf.com. MOOCtracks provides a comprehensive directory of MOOCs, allowing users to quickly find the course that best fits their needs. By compiling information about a wide range of classes and making it easily accessible through their robust search engine, MOOCtracks offers a valuable resource for individuals as well as corporate training departments to access free and low-cost online education opportunities at the click of a button. Visit http://www.mooctracks.com for more information. Unlimited articles from the top thought leaders in recruitment and careers. Petaluma, CA, USA (February 25, 2015) — Cross-Post LLC announced today the launch of a CareerNews Portal as part of its CareerPointe Newspaper Recruitment Classifieds Platform. The move allows newspaper partners to offer up-to-the-minute career advice from the thought leaders and social media influencers in the careers/recruitment market segment. The platform is powered by Sociative and includes software that measures article performance against social media exposure. This enables newspapers to filter through all of the content receiving those that are generating the most interest in the Twitterverse and other social media venues. “There is so much content out there and candidly much of it is recycled and “spun” articles. Our Sociative software enables us to weed through the thousands of articles daily and provide a white labeled content stream for our newspapers of only the best relevant articles and videos.”, noted John Fujii, Cross-Post President and COO. Newspapers and broadcast media publishers can bolt the white-labeled content stream onto their existing recruitment platform or get it for free with Careerpointe with a rev share income opportunity as well. Content changes daily and articles are ranked by the number of people visiting them and trends on Social Media. “One of the biggest complaints we here from publishers is that the careers/recruitment space is so niche that existing staff members are limited in what they can write on the subject. Content drives traffic and top content drives even more visitors to their websites and job pages. Having the best and brightest thought leaders in the industry providing content helps the publishers and those writing the content as each click often generates revenue to them.” Said George Dratelis, Director of Business Development. An example of the news feed can be found at http://CareerNews.Careerpointe.com. Since 2004, Cross-Post has been a leader in the niche recruitment advertising market providing more than 200 newspapers and publishers, low cost or no cost revenue generating opportunities. Social Media, SEO and Predictive Analytics lead conference topics in Europe and USA. Athens, Greece (October 26, 2014) — Cross-Post LLC, parent company of Careerpointe™ Recruitment Classifieds Platform and Cross-Post Classified Networks, is attending two international recruitment events this week focused on Social Media, SEO and Predictive Analytics. The International Classified Media Association #ICMAAthens annual conference was attended by CEO Carl Braun and Director of Business Development George Dratelis. The event, held in Athens, Greece featured speakers from Europe, Africa and the USA and was held at the Intercontinental Hotel. On Monday, October 27, Braun will be flying from Zurich to Las Vegas to participate in the International Association of Employment websites, (IAEWS) Fall Congress, which will be attended by more than 100 CEO’s of employment websites and associated services. “In the history of the job board business we have never seen more attention paid to advanced technologies delivering improved results from SEO, Social/Mobile and Predictive Analytics. The future of our industry will be controlled as much or more from activities in the back of the house as from marketing efforts on the customer side. Mobile will top the list and events like these are a wonderful opportunity to network and share ideas,” noted Braun. According to Google, mobile search eclipsed desktop recently with 54% of users on a smartphone or tablet. “Europe has a fresh way of looking at traffic development and innovative strategies for employment websites I think,” said Braun. “Several of the folks that are here in Greece at this event will also be attending IAEWS.” He added. Cross-Post launched the Careerpointe™ Recruitment Classifieds Platform earlier this year from a partnership meeting they had with CareerLeaf of Toronto, Canada at the Spring IAEWS Congress in Nashville. Their award winning (ONREC2014) Tracklet™ technology is now a key component of the Careerpointe™ platform. Braun and Dratelis plan on taking information and partnerships made at these events to create the next generation of candidate-focused job boards. “Don’t be too surprised if International plays a huge role in the next product launch.” Dratelis said. Cross-Post LLC was founded in 2004 by recruitment industry executives Carl Braun and John Fujii. It provides niche classified recruitment networks to publishers and today has nearly 200 newspaper clients. The addition of the CareerPointe™ Recruitment Classifieds Platform and the WheelPointe™ Auto Platform offer customers increased flexibility with no long term contracts and dramatically reduced costs. First step towards guaranteed network results for client newspapers. Petaluma, CA, USA (September 22, 2014) — Cross-Post Classified Networks, the leader in the niche newspaper recruitment space, announced today that they have partnered with Recruitics, a NY-based recruitment marketing agency and automation platform to manage their promotion and marketing of client classified advertisements on specific niche job boards. The move is aimed at increasing response rates for employers placing ads with their local newspaper. “We’re committed to providing the highest quality advertising options for our clients. By working with Recruitics, we are able to leverage their real-time reporting capabilities to identify underperforming job postings and apply additional marketing resources to improve results. It is the first step in what we hope will be guaranteed results for our clients in the very near future.” noted Carl Braun Cross-Post LLC CEO and Co-Founder. Recruitics has developed a sophisticated recruitment marketing analytics and automation platform that uses established rules to gauge conversion rate, clicks and applies and matches it to marketing spend. The Recruitics marketing platform is used by major companies, staffing firms, and recruitment advertising companies worldwide. “The web is a very dynamic advertising environment and it is constantly evolving. What works today may not be as successful tomorrow. Recruitics automatically keeps us ahead of the curve as search engines modify the algorithmic playing field to generate more revenue for themselves.” Said John Fujii Cross-Post COO and Co-Founder. “The marketing effort began on September 1, 2014 in partial response to these search engine limitations and we have committed to a six figure ongoing campaign to boost traffic,” he added. Cross-Post LLC was founded in 2004 by recruitment industry executives Carl Braun and John Fujii. It provides niche classified recruitment networks to publishers and today has nearly 200 newspaper clients. The addition of the CareerPointe™ Recruitment Classifieds Platform and the WheelPointe Auto Platform offer customers increased results with flexible terms and dramatically reduced costs. For more information, visit http://www.cross-post.com. Recruitics makes it easy for companies to get amazing results from their online recruitment advertising. Recruitics combines a revolutionary recruitment marketing analytics and automation platform with agency services to ensure its clients drive maximum results from their pay-per-click (PPC) advertising strategy. Recruitics is headquartered in New York City. For more information, visit http://www.recruitics.com. New option for employers provides a lower cost, responsively designed platform with award winning tools to improve the candidate experience. 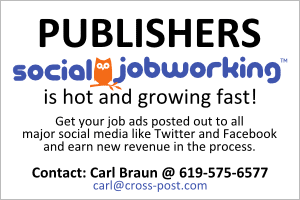 Petaluma, CA, USA (August 20, 2014) — Cross-Post LLC announced today the launch of its new CareerPointe™ Recruitment Classifieds Platform designed for the newspaper industry. Cross-Post LLC, the leader in providing niche recruitment networks for ten years, serves nearly 200 newspapers in North America offering products that enable publishers to help employers recruit in specialty niche markets. Their SocialJobWorking® Network transformed the industry and other networks like Diversity, Veterans, Healthcare, Nursing, Trucking and others utilize some of the largest job boards on the web to deliver qualified talent at a fraction of the cost. “We have listened to our customer’s needs for a stable, cost effective and responsive Recruitment Classifieds Platform. The key challenges they face with their existing platforms are mobile and social compatibility, flexibility, ease of use and most importantly tools to improve the candidate experience. We have responded with a comprehensive design that includes an award winning (ONREC 2014) technology developed by Careerleaf of Toronto Canada that puts control of a candidate’s careers back in their hands.” noted Carl Braun, Co-Founder and CEO. “The trend was a very important topic at the recent IAEWS Conference (International Association of Employment Websites) in Nashville,” he added. Careerpointe™ will be made available to existing as well as future potential clients with very competitive pricing and no long-term contracts making it both affordable and lucrative as newspapers and publishers will have several new options for earning additional, incremental revenue, but more importantly the candidate stickiness that other job boards lack which makes the revenue gains even more achievable. “Newspapers have a loyal, local audience. Once that readership realizes they can use the newspaper platform to manage all of their job search efforts, no matter what the site, they will respond accordingly.” Braun noted. “Historically, job boards have placed primary focus on employer acquisition. The candidate relationship has been assumed. Essentially its been ‘If we build it they will come’ Today, there are so many options for passive and active candidates that they can be quite selective on which boards they work with and which companies they ultimately work for. Careerpointe™ is one stop shopping for job candidates. They can use the free tools to do everything from apply with a mobile device to search for free online courses to improve their resumes and their knowledge.” said John Fujii, Cross-Post President and Co-Founder. The Newspaper Recruitment Classifieds platform was designed exclusively for the newspaper industry and helps them generate revenue easier from niche networks and other products not currently available in the marketplace. It connects seamlessly to all existing sales systems. “I am TRULY amazed with CareerPointe™. As recruiting professionals, we try to make sure we are constantly evolving. Careerpointe™ adapts to new SEO requirements instantly and provides innovative tools to maximize revenue from an enhanced candidate experience.” noted Chelle Bize, former Manager of Recruitment Advertising with the Las Vegas Review Journal and Manager of Special Projects for the Technology Division of Southern Nevada Goodwill. “Cross-Post has doubled in size in the last two years due to unique partnerships and an eye on the future of our industry. We have taken that growth and doubled down on new and innovative products for our customers who are intrigued about hire performing, lower cost options.” Said Braun. Cross-Post LLC DBA Cross-Post Classified Networks has for ten years provided newspapers with leading edge recruitment networks and technologies enabling them to boost revenue and improve customer results. Cross-Post offers many networks including Diversity, Healthcare, Veterans, Trucking, Nursing, Green Employers, Call Center/Customer Service, Sales & Marketing, IT Jobs, Manufacturing & Engineering and SocialJobWorking®. Cross-Post is a sponsor of the Confluence Social Media Conference being held in Oklahoma City September 6th 2014. Cross-Post LLC works with nearly 200 newspapers in North America including the Washington Post, Tulsaworld, The Oklahoman and the Milwaukee Journal Sentinel. The company was founded by recruitment and Internet executives Carl Braun and John Fujii in 2004. Recruitment Tool Combines Print, Digital and Social Media for Canadian Employers. Toronto, Canada (October 9, 2013) — Cross-Post Classified Networks announced today the release of their SocialJobWorking™ network for the Canadian market. SocialJobWorking™ is a tool used by some fifty plus newspapers in the United States to drive traffic to job postings through social media. Now Canadian employers can leverage hundreds of regional and category specific job channels on Twitter, Facebook and other social networks through their local newspaper. “SocialJobWorking™ uses specialized software developed by TweetMyJobs.com to take newspaper postings and push them out electronically to the leading social media and mobile destinations. Cross-Post has a ten-year history of partnering with newspapers to increase traffic and drive incremental new revenue.” Noted Carl Braun CEO of Cross-Post LLC. Until now, Twitter, Facebook and other social recruitment postings have largely been done manually or with cumbersome and time-consuming web tools. SocialJobWorking™ automates the process and optimizes the “Tweet” or social posting for category, job title, location and description. This greatly enhances the targeted nature of social recruiting. This also allows for the posting to be removed once the position is filled eliminating unwanted responses and a damaged brand caused by candidates applying for a job that is already filled. This is an exclusive feature of SocialJobWorking™. Newspapers offering the SocialJobWorking™ option can combine the social media recruitment with existing print and digital advertising creating a broad and powerful recruitment tool. “We are considering partnerships with newspapers in Canada that share an interest in driving increased traffic for their employers. Some US newspapers have seen average traffic increases up to 1000%.” Added Braun. Jobs are also posted out to the TweetMyJobs.com desktop application and appear on their mobile tool that utilizes “augmented reality.” This allows job candidates to point their smartphone camera at an employers building and see all the jobs available inside that company. Newspapers or media groups interested in exploring a partnership that can dramatically increase traffic and incremental revenue, should contact Carl Braun, at 1+619-575-6577 or carl@cross-post.com. Headquartered in Petaluma, CA and with offices in Austin, TX, Cross-Post LLC, DBA Cross-Post Classified Networks provides employers, through local newspapers, with niche classified recruitment options. Serving more than one-hundred newspapers in North America, Cross-Post has networks like the Diversity-Job Network, Healthcare Network, Veterans Network, Nursing Network and others. Prominent partners include: The Washington Post, Milwaukee Journal Sentinel, TulsaWorld, The Oklahoman and The Las Vegas Review Journal among others.